NorthGate College (NGC) began in 1999 at St. Augustine, Trinidad & Tobago with 100 students but within a few short years the population grew to just below 300 students. The current curriculum not only offers a range of the usual academic material but goes beyond to include issues of character, manhood, womanhood and successful management of life in an age of globalisation. 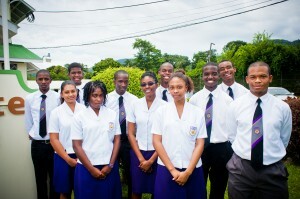 NGC has always distinguished itself for the moral uprightness and discipline of its students. NGC students are recognised by their sense of purpose, confidence and their willingness to challenge the status quo while respecting authority structures. The national honours that NGC students have achieved in debate, sports and music throughout the school’s history have also borne witness to the emphasis that the NGC process places on full human development. Furthermore, NGC has been able to build an environment and culture that is able to take students from failing systems and effect not only an academic transformation but develop students of character and confidence who are aware of their individual purpose, worth and societal responsibility.